Has there ever been an anime that was not based on a manga? I notice that most if not all were actually mangas before they were turned into a TV series. Let's take a quick sample of full-length non-children's anime that began airing during the current season (Winter 2014) and see which are based on manga. As we can see, roughly half of the series this season are based on a manga, and roughly half are based either on a work in some other medium or are wholly original. To make a broader point, we can take a look at some data collected by user /u/homu on Reddit (link). 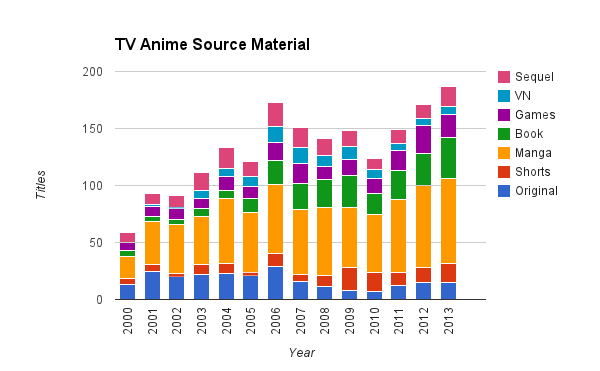 As we can see from this graph, manga has historically been the source for at least a plurality of anime adaptations (though never a majority, at least since 2000). However, other sources are by no means negligible. In particular, the rise of light novels starting circa 2005 appears to have eaten into the market share of manga adaptations, and shows no sign of slowing down as of yet. All said and done, yes - anime that aren't based on manga are pretty common.